CHICAGO (WLS) -- One Chicagoan will win the same 2016 World Series ring that Bryant, Rizzo, Zobrist and all the 2016 Chicago Cubs players received. Cubs Charities is holding a raffle to win the same 2016 World Series ring the players were awarded, but the raffle is only open to Chicago residents. Tickets for the ring raffle are $10 each and went on sale Friday. Tickets may be purchased until September 4. The winner will be announced on September 5 and will be required to provide proof of Chicago residency. 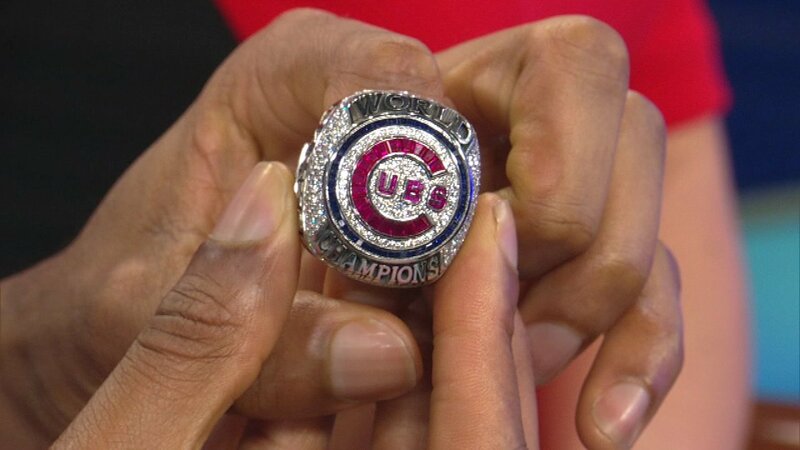 The "player-grade" ring is made from 14-karat white gold and features 33 red rubies, 72 white diamonds and 46 blue sapphires to form the Cubs logo. The logo is surrounded by 108 diamonds to signify the team's 108 years without a championship. It is identical to the rings all the players received with one exception - the ring will be engraved with the winner's name. Anyone may purchase raffle ticket at the stadium during game days and at two kiosk locations in the city. Tickets may also be purchased online, but online sales are limited to Chicago residents. Proceeds from the ring raffle benefit Cubs Charities.